1st US LotR's - Burgandy Leather - 1st impressions w/full leather case - Full-Leather. Full-Leather. No Jacket. 8vo - over 7≤" - 9≤" tall. Houghton Mifflin , 1954/1955/1956 1st US Edition, all 1st impressions with date on the Title Pages. The Fellowship of the Ring is a 1st impression published 1954, one of only 1500 copies imported from Allen & Unwin, and bound in the US. 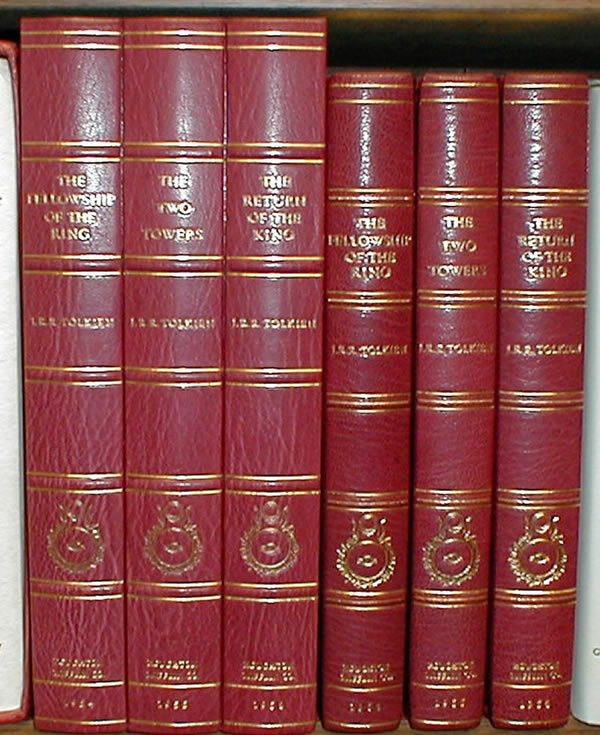 The Two Towers is a 1st impression published 1955, one of only 1000 copies imported from Allen & Unwin, and bound in the US, making it the rarest of the 1st Edition Lord of the Rings. All original maps are present and in Near Fine condition. An extraordinary set of first editions of this classic of fantasy literature. The set is fully rebound in Burgundy Morocco Leather, all edges trimmed and gilded. 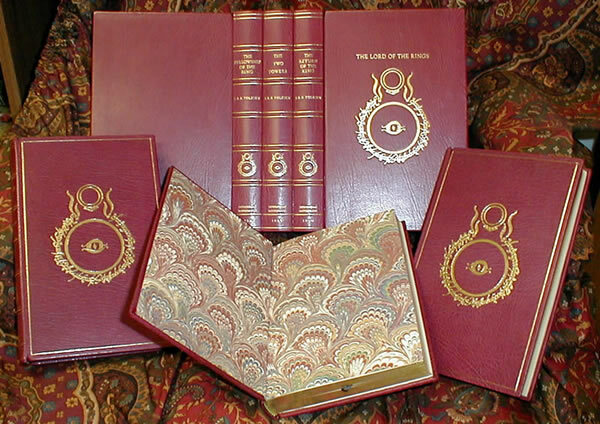 The set is further characterized by Marbled endpapers, black silk ribbon markers, and is housed in a full leather clamshell case that mirrors the image of the spines of the books. These are distinguished by compartments, with raised bands, gilt tooling, and gilt ruled edges. 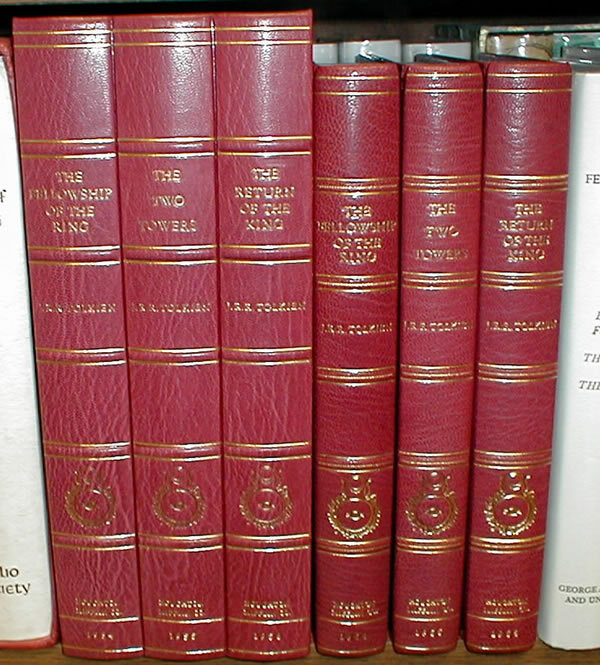 Title, Author, Publisher and Date, as well as a 'Ring and Eye' device from the original UK dustjackets are featured in the compartments, and a larger version of the 'Ring & Eye' on the front boards of all three books and the clamshell case. A beautiful design, executed by one of America's premier binders. All are very clean and bright, with no foxing, and with no writing or signatures. Beautiful looking set, with a classic design.